In todays fast paced environment where massive construction using reinforced concrete is undertaken, but time takes a toll over the steel bars or TMT used in construction.Despite the relatively long record of performance of calcium nitrite-based admixtures, used for manufacturing concrete, concerns regarding their long-term effectiveness, toxicity and environmental impact have tended to limit their fields of application. 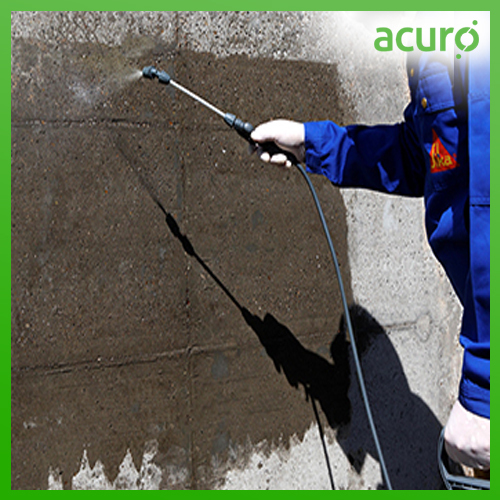 Acuro Organics Ltd. has developed a powerful surface-applied concrete corrosion inhibitor ACUROCOR CS33, designed to penetrate through concrete, mortar and limestone. It protects the anodic as well as the cathodic areas within the corrosion cell. Recommended for: preventative maintenance of existing reinforced, or marine concrete structures, bridges, highways, and industrial floors exposed to aggressive environments, parking garages, concrete piers, dams, offshore platforms, pillars, pipes, utility poles, cooling towers and concrete potable water structures. ACUROCOR CS33 is easily applied by spray, brush, or roller and does not etch, stain, discolor, or otherwise harm glass, metals, or automotive paint. Its state-of-the-art formula offers low permeability to water, even at 10 bar positive and negative pressure, and very high diffusion resistance to carbon dioxide gas and chloride ions.